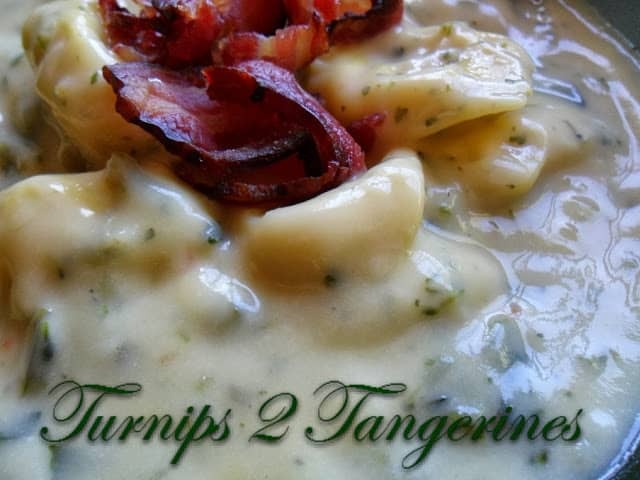 If your looking for a fast and easy soup that’s satisfying and super delicious, Cheesy Broccoli Tortellini Soup is For you. 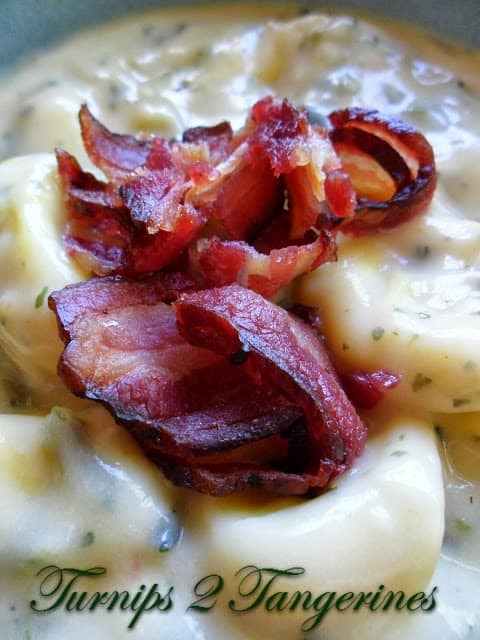 This soup is packed full all of our favorites; celery, onion, green pepper, shredded carrots, frozen chopped broccoli, Velveeta, cheese tortellini and chopped, crispy bacon. What could be better on a cold winters day than a steaming bowl of cheesy broccoli tortellini soup? I can’t think of anything either. In Dutch oven or soup kettle, heat oil over medium heat. Add celery, onion, green pepper and carrots. Saute’ until veggies are tender, 5 to 10 minutes. Stir in water, chicken broth, Italian seasoning, salt and pepper. Bring to a boil, reduce heat to medium low. Add broccoli, Velveeta cheese, cheese tortellini and 1 tablespoon dried parsley. Stir until cheese is melted and broccoli and tortellini are tender. Yum. So cheesy and good! Looks quick too. It's not often you see that in a soup. Thank you for linking. Hope you are having a great weekend, Lynn! Hi Lizbeth~ Thank you so much for your nice comment! That made my day:) That's a shame your family doesn't like soup! I could eat soup every single day and now that the weather has turned colder, I usually do! This soup makes 6-8 servings…..depending on the size of your bowl etc. I like a Big Bowl, when I eat soup..lol. You could definitely make a smaller batch, in fact, now that it is just me and the hubby at home, I have to make smaller batches too. Another thing I like about soup…you can pretty much do anything to a batch of soup and it will still taste good:) Enjoy! Perfect on this chilly day we are having here in Northern WI…..37 degrees this morning.